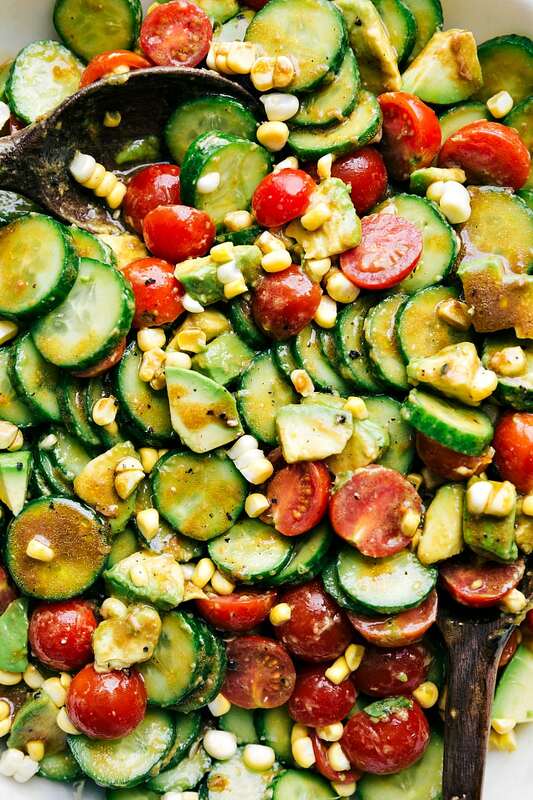 This cucumber salad is loaded with corn, avocado, tomato, and is so easy to make! Growing up my mom would make a tomato and cucumber salad almost every Sunday night. It was such a simple salad, but I LOVED it. There’s just something about a fresh cucumber salad that really adds a lot to a meal. I’ve taken my mom’s cucumber salad to the next level by incorporating a balsamic dressing and some avocado. The avocado adds just enough to really change the dynamic of the salad. And combined with the dressing, really turns this into a delicious dish! This is definitely going on our Sunday dinner rotation. To save time slicing cucumbers you can use a mandoline slicer. If you don’t have a mandoline slicer you can also use the slicer section of a cheese grater to cut thin coins of cucumber. To cut all your cherry tomatoes at ONCE: place a plate with a lip upside down on a solid surface. Place all the cherry tomatoes inside that lip and then secure them down with the lip of another plate. Place your hand on top of that plate securely and using a sharp serrated knife you can slice through all of the cherry tomatoes at one time! To make this salad even faster, use raw corn off the cob. In the recipe below I share how to grill the corn, but raw corn is also yummy and we love it both ways equally! For this cucumber salad recipe I find that either Persian or English cucumbers work the best. These varieties of cucumber are less bitter, have less seeds, and are more flavorful than regular cucumbers. Of course regular cucumbers will work just fine (just look for seedless!). Unfortunately this is a salad that doesn’t do well being made too far in advance. To keep this salad as fresh as possible I wouldn’t prep ingredients more than 4-5 hours in advance. However, the dressing is the one exception to this rule: it can be stored in the fridge for up to 1 week, so you can make that ahead of time! 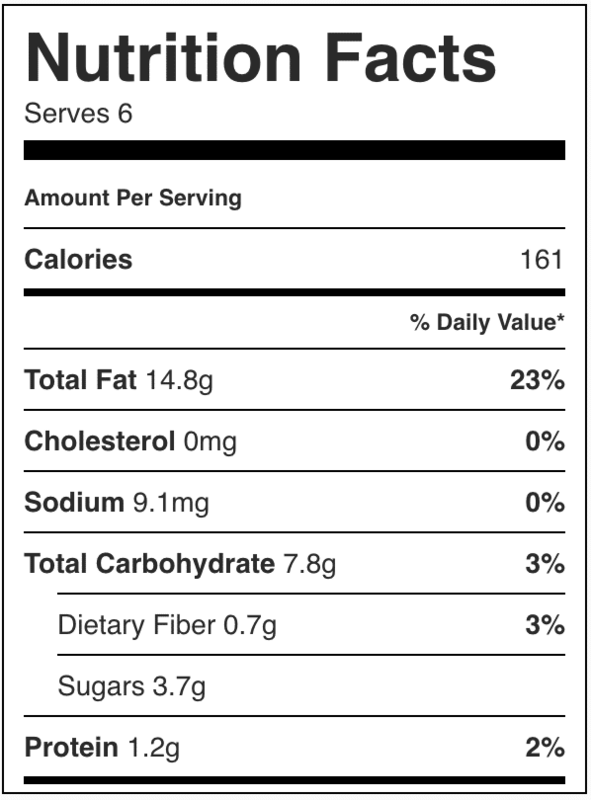 Additionally, this cucumber salad isn’t one that stores well. Once the salad is tossed with the dressing, it will last about a day. 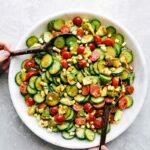 This balsamic dressed corn, avocado, tomato, and cucumber salad is packed with flavor and so easy to make! 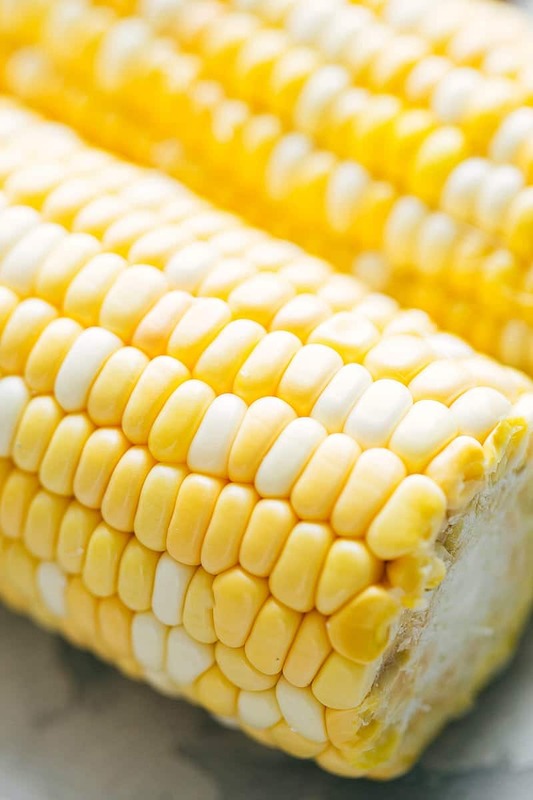 If desired, grill the corn on the cob (we love it grilled or added raw!) For grilling directions see post. 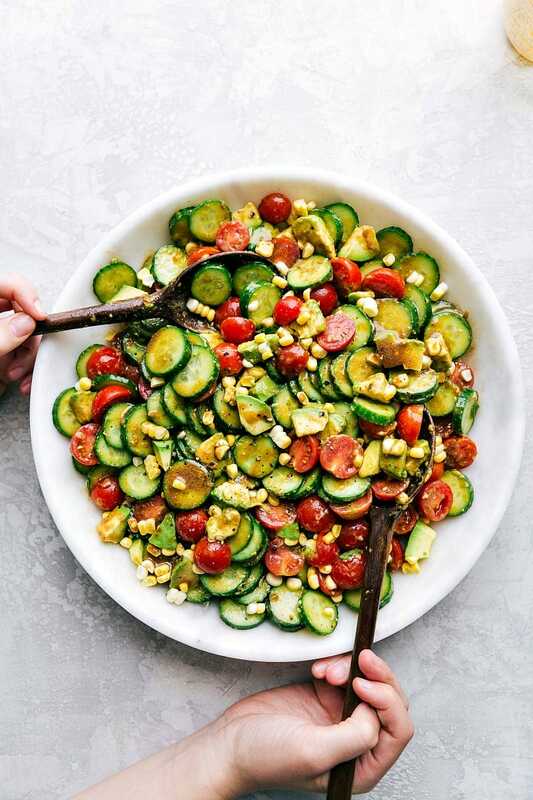 In a large salad bowl, combine the halved cherry tomatoes, coined Persian cucumbers, diced avocados, and the corn cut from the cob. For the vinaigrette add all the ingredients together in a mason jar. Add salt and pepper to taste; I add 1/2 teaspoon salt and 1/4 teaspoon pepper and then add more to the salad overall. Shake the dressing well right before pouring over the salad. 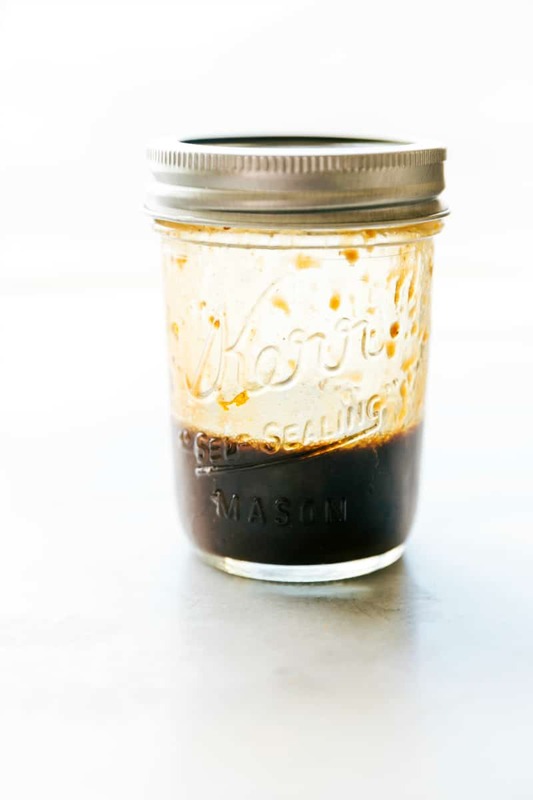 Pour the dressing over the salad, toss, and enjoy immediately! This salad doesn't sit well with the avocado and dressing so don't add either until right ready to eat! I had a ridiculous amount of fresh tomatoes and cucumbers from our garden last year (I surely will again this year too)…so this recipe is perfect! Awesome salad, scheduled to be shared on Welcome to My Kitchen on Facebook with appropriate credit and a link. Great tip on how to slice the tomatoes! I’m always looking for great veggie side dishes for the kids, this looks great! Great recipe very easy! I served with grilled Cajun chicken ?